As part of Ryan Zinke’s transparent effort to dismantle the BLM and open public lands to oil exploration, the agency has offered up 118 Montana parcels to be sold at auction next December. The BLM offers leases for sale three or four times a year, and the number of Montana leases has increased dramatically since Zinke became Secretary of the Interior. Between 2013 and 2016, each BLM lease sale included a small number of Montana leases (and some none at all), but since Zinke took office each sale has included between 100 and 200 Montana leases. 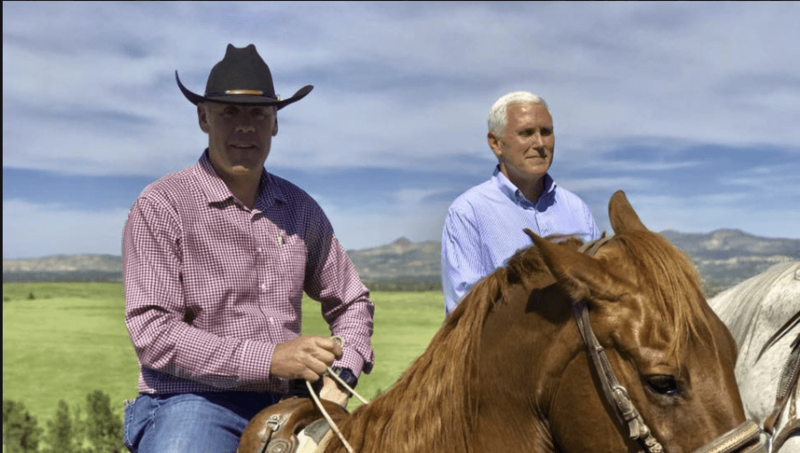 Ryan Zinke with Vice President Pence in Nye, Montana last year, with Beartooth Mountains in the background. If Zinke has his way, this landscape will include oil rigs from BLM leases. Along the Beartooth Front, there are several Carbon County leases and none in Stillwater County included in the list for December sale. Stillwater County leases were deferred at the last minute in the March sale. Achieving this rapid pace has required the BLM to ignore safeguards built into the process since the National Environmental Policy Act (NEPA) was passed in 1970. Leases typically require an environmental impact analysis, but the BLM has bypassed this step for many of the leases. In February, the Department of Interior sought to speed up the approval process for oil and gas development on public lands by encouraging the use of “determinations of NEPA adequacy,” a BLM policy where the agency doesn’t have to carry out environmental studies if previous studies would apply. The National Environmental Policy Act requires environmental study of federal projects as part of the public process. Also, a June 23 Department of the Interior memorandum reversed a rule requiring an environmental review of oil wells on non-federal land if they end up drilling beneath federal land. The push to expedite lease sales has led to a series of lawsuits to block the sales. A court order blocked 223 lease sales in June after the Western Organization of Resource Councils (WORC) successfully challenged additional resource action in the Powder River Basin. Since that ruling, WORC has argued for a hold on new leases in the area until the BLM updates its old management plans (RMP) with new information on pollution and climate change. As a result of this suit, all leases involving the Billings Field Office have been deferred for the December sale until the Billings RMP can be updated to protect these areas. This includes the proposed leases in Carbon County. There is another suit that may affect the sales, and it is one in which I am personally a plaintiff. It challenges leases sold in December 2017 and March 2018. The suit claims that the BLM failed to prepare an environmental assessment that looked at possible groundwater contamination and greenhouse gas emissions. Montana BLM proposed December lease sales. Click for link to interactive map. What is particularly upsetting about this is that these lease sales are unnecessary. The leases are not in the middle of the Bakken or other major extraction areas. They are mostly in undeveloped areas, often in drainage areas near rivers like the Stillwater, the Clark’s Fork, the Tongue and the Yellowstone, and are cheap enough so that speculators can purchase them and hold them for ten years. And not to put too fine a point on it, for those of you interested in the Beartooth Front Landowners’ suit against the Stillwater County Commissioners, the Commissioners have hired a law firm headed by Zinke’s top choice to run the BLM, who has consistently advocated to get rid of federally held land. If not coordinated, these things are certainly happening in concert. You can find the document containing the list of proposed Montana leases at the BLM web site. You can file a comment about any one of the them (or group of them) by clicking here. Instructions for commenting can be found here. Note that the comment period ends on July 20. Commenting does make a difference. The Stillwater County deferrals in March occurred in part because so many people commented. This entry was posted in BLM leases and tagged BLM leases, NEPA, Ryan Zinke. Bookmark the permalink.